Partner/Operator - 1973 Ferrari 365 GTB4 Daytona. 4,390cc DOHC V12 Engine 6 Weber Carburetors 352bhp at 7,500rpm 5-Speed Manual Transaxle 4-Wheel Independent Suspension 4-Wheel Disc Brakes *Ferrari Classiche Red Book Certified *Matching numbers engine and original coachwork *Shown successfully at some the most discerning Concours events *Stunning example of the legendary Daytona Berlinetta. THE FERRARI 365 GTB/4 The concept of manufacturing a 4-cam V12-engined Berlinetta with considerably greater power output than the successful 275 GTB/4 model emerged in 1967, as soon as the 3.3-liter variant was being launched upon a receptive market. The new model would have to meet newly developed US federal regulations, which meant a tremendous amount of time-consuming development work before the new design could be introduced. Ferrari's first known prototype for such a car emerged during the winter of 1967 with bodywork presaging the final design that would be adopted, although its front-end treatment looked back towards that of the 275 GTB. It used a three-valve per cylinder 4-liter V12 engine that was not taken further. Instead a Tipo 251 power unit would be adopted, which was a more conventional 4.4-liter with hemispherical combustion chambers in its twin-cam heads, and single-plug ignition. The block had been lengthened to accommodate a bore and stroke of 81mm x 71mm, identical to the Tipo 245 engine's, which already powered the 365 GT 2-plus-2, GTC and GTS models. The new 4.4-liter unit was lubricated by a dry-sump system with a 14-liter separate tank. The compression ratio was 8.8:1 and with six Weber 40DCN carburetors, the engine delivered a muscular 352bhp at 7,500rpm, with 318lbs/ft. torque at 5,500rpm enough indeed, as one English technical writer of the time described as being "...more than enough to pull your house down". The mechanical ensemble, comprising engine, torque tube, and rear-mounted five-speed transaxle was attached to the tube chassis at four points two on the engine and two on the transaxle and the familiar 2.4-meter wheelbase was retained, which dated back in unbroken line to the 250 GT SWB. To clothe the new 365 GTB/4, Pininfarina created a classical and now legendary design, which combined Maranello tradition with modernity. Only the prototype body was actually built by Pininfarina and as with the preceding Berlinettas it was Scaglietti who actually made the bodies in steel (with opening panels in aluminum) for the production examples. The venue for the new model's launch was the October 1968 Paris Salon, and its immediately successful reception saw it being nicknamed the 'Daytona' in honor of the Ferrari factory team's 1-2-3 defeat of the mighty Ford GT fleet in the 1967 Daytona 24-Hour race. Shortly after debuting the gorgeous GTS/4 Spider, a number of important revisions were introduced on both the Berlinetta and Spider versions. These changes came about as a result of the newly imposed federal safety legislation in the USA that deemed covered headlights illegal. Ferrari and Pininfarina were subsequently being forced into carrying out a mild front-end makeover. Their answer was to fit the Daytona with retractable headlights in early 1971. Capable of achieving 278km/h (172mph) in standard form, the new Ferrari was the fastest production car in the world at that time. THE MOTOCAR OFFERED This gorgeous example of the legendary Ferrari 365 GTB/4 Daytona was completed on March 20, 1973 in Clear Red (Rosso Chiaro 20-R-190) over a black interior (Nero VM 8500) in Connolly leather. It is a left-hand drive European version with air conditioning and extensive research shows that chassis 16519 was number 1,029 in the assembly sequence, bearing Scaglietti body number 1063. Within a few weeks of completion, this Ferrari 365 GTB/4 was delivered to Geneva, Switzerland and sold to a private collector. Documentation is incomplete, but it appears that the Ferrari spent a brief spell in Portugal before making its way to Sweden in 1976, where it remained for seven years, after which it was exported to the United States by a Ferrari enthusiast in Virginia. In 1986, the Daytona was purchased by Stanley Cohen of Windsor, Connecticut, who registered the car with the Ferrari Owners Club and retained it for his personal collection until June of 2000. With only 13,000 kms on the odometer and now sporting a new tan leather interior, the car was acquired by Herb Chambers, CEO of The Herb Chambers Companies the largest automobile dealership in New England, based in Somerville, Massachusetts. According to correspondence with Chambers which accompanies the car, he purchased the Ferrari Daytona for his own private collection and personal use and added a new set of Borrani wire wheels. The current owner acquired the car in 2005 with just around 15,000 kms on the odometer a figure indeed believed to be the cars actual mileage - and immediately exhibited it at the Quail Motorsports Gathering in Carmel Valley, California. The Daytona went on to garner several awards at various events, including Best of Show at the Highland Village Ferrari Festival in Houston. Since 2005, the current owner has driven the car less than 10,000 kms and stored it in an air-conditioned garage. Most recently the Ferrari has undergone a full inspection and compression test by Ferrari of Houston in preparation for the Cento-Miglia in New Orleans, and is deemed to be in very good condition a testament to over 30 years of meticulous care and maintenance. 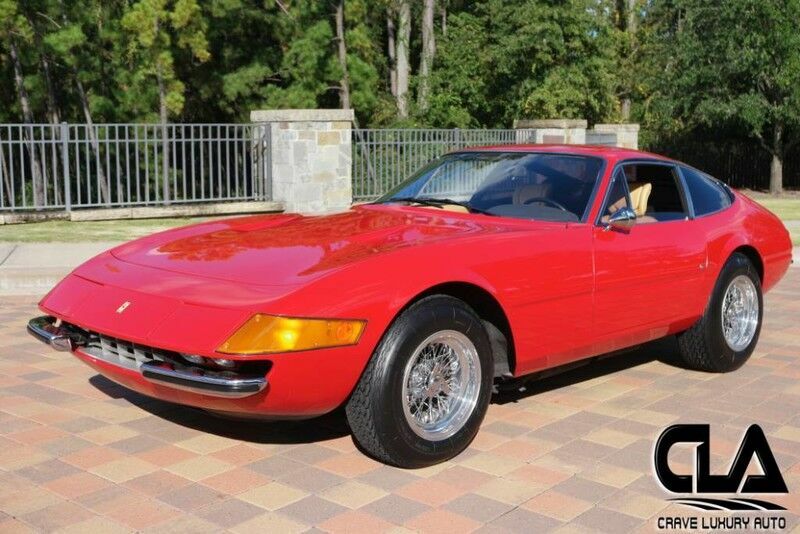 This Ferrari Daytona has never been modified or compromised and is a matching numbers car, as is testified by the Ferrari Classiche Certification or Red Book which accompanies the car. The sale also includes the original owner's manuals, books and tools. Dressed in an iconic robe of Pininfarina design and Scaglietti craftsmanship, it has become a standard bearer for the legendary Ferrari marque. We welcome any pre-buy inspections before purchase and can help facilitate door to door shipping to anywhere in the world at an affordable price. Crave Luxury Auto is located in The Woodlands, TX (north side of Houston, TX). Call us and schedule an appointment to visit Crave Luxury Auto. If you have any questions or would like to schedule a test drive in this vehicle, please call us anytime at 281.651.2101 . Thank You for visiting another Crave Luxury Auto Listing! You can always view our online inventory direct at www.craveluxuryauto.com . If you prefer to communicate via email, one of our representatives are always available at craveluxury@gmail.com . Crave Luxury Auto offers an extensive range of superb, low mile, exotic and luxury automobiles. Trade-in proposals are always welcome.